The modest little production that this movie is, looks much bigger and better than it should be, due in part to the way it was filmed by director Kurt Neumann. Released by 20th Century Fox using the Regalscope format, which was just another name for Cinemascope, it made She Devil look and sound fantastic. Sadly, the film was not as good as its sheen. 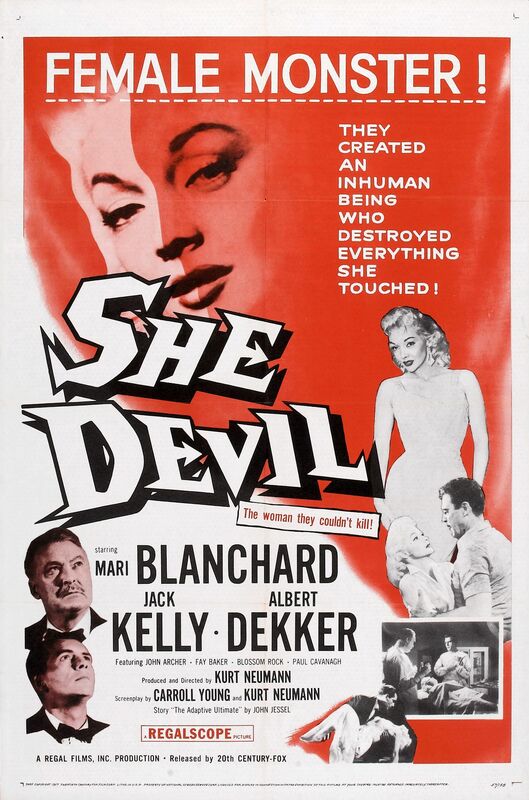 Mari Blanchard stars as the titular devil in question and gives a fairly riveting performance as the woman whom life had done wrong. She is beautiful when she is a brunette, but stunning when she is a blonde and uses her feminine wiles to gain what she wants in the film. Having had tuberculosis and being near death, she no longer wants to go back to that state after she was cured using Doctor Scott’s experimental serum. So Kyra does what she wants and takes what she wants whenever she wants and no one will tell her that she cannot. It also helps that she is now invulnerable to harm as well. Invulnerability by this point in time was nothing new, with many movies and books all featuring the ability. Whether alien, supernatural or even through science, moviedom’s fascination with it would continue through the years. It goes hand in hand with the ever elusive immortality that all mad scientists seek and is only a short step removed, being similar and a power, an ability, that everyone would like to have. Like any power, it could be used for good or evil and in the case of this movie, Kyra uses hers for personal gain. It is a temptation that would be hard to resist for any man or woman. Obsession plays a big role in the film. Kyra of course, obsessed with living life to the fullest, which is not a bad thing in and of itself, but the way she goes about it definitely needs improving upon. Jack Kelly who plays Dr. Dan Scott, is a man obsessed and the man who gave Kyra the formula in the first place to save her life. When he sees her rise from her deathbed he is instantly stricken with her. No matter what she does throughout the film, even after killing two people, he cannot help loving her, or at least thinking he does so. In the end he manages to overcome his fascination and attraction and does the right thing, where if the roles were reversed, Kyra would do nothing of the sort. 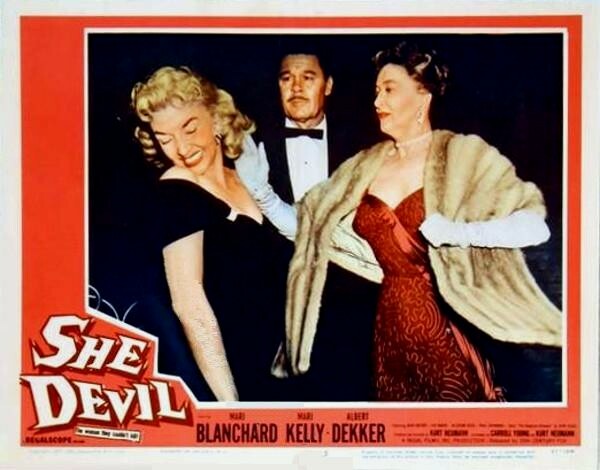 Sadly or fortuitously, Blanchard steals the show and overpowers both Kelly’s and Albert Dekker’s performances. She is the bad girl that everyone loves in the film and the type of girl the audience loves as well. Kelly was good as the love-struck fool and the gentlemen scientist, but did not seem strong enough for leading man material. Dekker, who plays Kelly’s partner in the film is okay, but often seems like he is just there for the pay cheque and nothing else. Overall the film was very mediocre with a story that has been done many times before and to greater effect. Frankenstein and Dr. Jekyll and Mr. Hyde come to mind, and though the movies obviously differ, the premise is the same and shows how different the end result can be. It also helps to have a better script and better actors, but all in all, She Devil made do with what it had. An interesting film, and definitely not the best, but Blanchard makes it worth watching. Interesting! The themes and plot anyways look interesting! Not the fact that it is only mediocre! I want to focus this comment on how annoying it is when an actor just shows up to collect a paycheck. That can legitimately ruin a movie and it truly is annoying. I cannot get excited for a Samuel L. Jackson film these days for that very reason! Come on Dekker, COME ON!!! Just loving your selection of cult movies to ponder over…. Thanks. I like older films and most people tend to review new releases. I don’t want to be just another voice that does the latest film in the theater every week. So, I try to do the majority of mine on older ones, ones I like, ones that look interesting, some popular and some more than likely not.